Due to the continued expansion of the service, a rare and exciting opportunity has arisen for 3 (2.6 WTE) enthusiastic and dedicated Specialist Screening Practitioners to join the Shropshire Bowel Cancer Screening Centre, based at The Royal Shrewsbury Hospital. The Shropshire Bowel Cancer Screening Centre has been managing the screening programme for a population of approximately 482,800 people, covering the geographical area of Shropshire and Telford & Wrekin since 2009. The screening sites are based at The Royal Shrewsbury Hospital and The Princess Royal Hospital, Telford. The post holders will be required to work flexibly across both sites and will include evening working; it could also involve weekend working as the service expands. The successful applicants will join an established, friendly and professional team, providing high quality care to all screening participants. The post holders will be required to work closely with the existing team to meet the requirements of the NHS Bowel Cancer Screening and Bowel Scope Programmes. You must be able to work effectively as part of a team and as an autonomous practitioner managing your own caseload of patients. 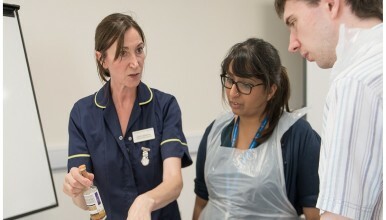 You will be responsible for undertaking nurse-led clinics including patient assessment and the provision of information and preparation and support of those undergoing endoscopic or radiological investigation. The role requires you to communicate and work closely with the wider MDT. You must have excellent communication skills and be able to communicate sensitive and complex information to both patients and colleagues, including breaking significant news. The post holder will have a shared responsibility to meet the Trust, Bowel Cancer Screening Programme and national targets. You will be required to undertake training in the use of the Bowel Cancer Screening IT system and complete the mandatory NHS BCSP Bowel Cancer Screening Practitioner Programme (Level 6 or 7) at John Moores University, Liverpool, which will require you to study away from home. In-house training and mentorship will be provided to fulfil the requirements of the role. Potential applicants should be a registered general nurse with at least 3 years post registration experience. Previous experience and knowledge of working in the following areas is desirable but not essential: screening, gastroenterology, endoscopy, pre-assessment or oncology. Good IT skills are essential as the post includes daily data entry into a national database. As this post requires working across different sites, the ability to fulfil the travel requirements of the role is essential.